Priestfield station opened at the joining of the Oxford, Worcester & Wolverhampton Railway's line from Stourbridge Junction and the GWR's line from Snow Hill to Wolverhampton Low Level in 1854. Above (photo: Michael Mensing) we can see the line to Snow Hill curve away to the left whilst '5100' class 2-6-2 tank 5151 makes a stop on its way to Low Level as it comes off the line from Stourbridge Junction. 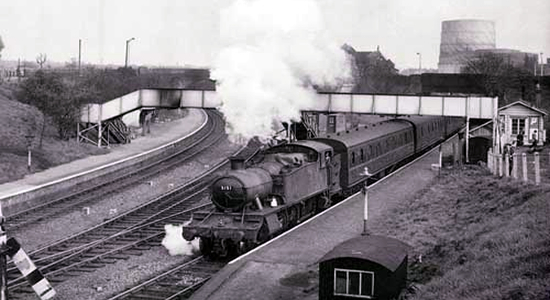 The station closed in two stages due to the fact that it provided a thoroghfare for two routes: the line to Stourbridge Junction via Dudley closed in 1962 with complete closure for the station coming in 1972 following the closing of the line from Snow Hill to Wolverhampton Low Level. However, it should be noted that the station had by that time fallen into complete disrepair and was served only by single car DMU shuttle services between Low Level and Snow Hill since the loss of mainline services in 1967. Above-left we are on the George Road overbridge looking at the same spot as shown in the photograph at the top of this page - the line between Snow Hill and Wolverhampton has, as is discussed elsewhere on this site, been relaid and provides the trackbed for the Midland Metro. The notable absentee here of course is the line to Stourbridge Junction which would have curved off to the right just passed the second set of overhead supports but is now filled-in. 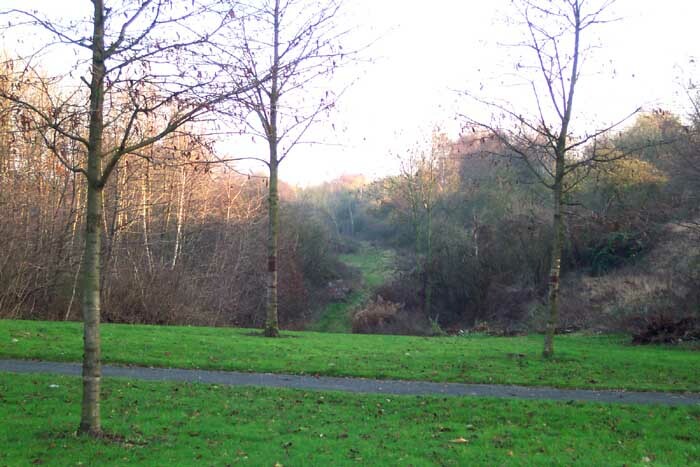 Above-right we are on Ward Street on what was the bridge over the Stourbridge Junction line looking along what remains of the trackbed towards Bilston West station. The road bridge parapet walls are still standing - albeit ornately reworked - clearly indicating the path of the former line. Above-left we are still on the Ward Street bridge but this time looking towards the site of the former station. 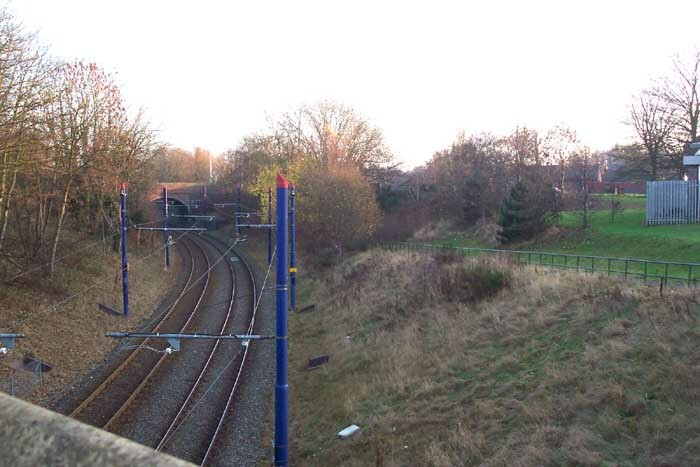 The trackbed is clearly discernible although its level has been considerably raised since its operational days: ahead is the rise to the parapet wall of Sidwick Crescent bridge - beyond which is the point of convergence with the Snow Hill line at the old station site. Above-right we have moved along Ward Street to the junction with Sidwick Crescent and can see the remains of the Sidwick Crescent bridge - the station lay immediately to the right of this bridge. Above-left we are a little to the right of the position of Michael Mensing when he took the photograph at the top of this page: the handrailed entrance pathway seen in that shot can be clearly seen in this photograph but the handrail has been replaced and there is, of course, no opening onto the trackside itself now. Above-right we are in the same spot but looking in the other direction through the George Street road bridge to give a perspective of the closeness of the old station site to the currect Priestfield Metro stop which can be seen through the archway.